This article originally appeared in the Stamp Collectors' Review, in two parts, on 15 November 1863 and 15 December 1863. This article was written less than 24 years after the introduction of the Penny Black. This would have allowed the author to obtain much first hand information from people who were actually alive in 1840 and could remember events clearly. This is probably one of the earliest articles which was written on the subject. From this article one can see that Rowland Hill first suggested a "stamped letter-paper", then a "stamped envelope" and finally an "adhesive postage label". The author tells us that in 1830 Charles Whiting suggested to the post office authorities what he called go-frees; something which does not appear in more recent articles on the subject. Also mentioned is a Mr. Stead of Yarmouth who "at a later period, counselled the employment of stamped paper in lieu of money payment to the post". The author of this article is no given, but is believed to be Edward Loines Pemberton. Edward Loines Pemberton was editor of the Stamp Collectors' Review from January 1864. Four-and-twenty years ago penny postage was unknown; but the propriety and practicability of the plan was being freely discussed, and chemical and artistic ingenuity, as well as the ingenuity of the financier, was busily occupied in devising labels which should recommend themselves to adoption by artistic beauty, and baffle the nefarious manufacturers of counterfeits by changes of colour under chemical tests, rigidly kept secret from all but the initiated. These experiments arose soon after Mr. (afterwards Sir) Rowland Hill proposed, in 1837, the penny postage system. A royal commission was appointed, but nothing came of the result of its deliberations; then the House of Commons was besieged with petitions — 320 in number, bearing 38,709 signatures; then a committee was appointed to examine the merits of the question, and reported favourably on the change proposed; then a London mercantile postage association was formed, and subscriptions poured in; then came meetings and the issue of tracts and pamphlets, and the getting up of 2,007 petitions, bearing 262,809 signatures; and finally, Parliament declared in favour of the scheme. But it must not be supposed that Rowland Hill was the only man who ever contemplated cheap postage labels. In 1830, Mr. Charles Whiting, a printer, suggested to the post office authorities what he called go-frees, which should frank letters passing through the post, after the same style as is done by our modern postage stamp. Mr. Stead, of Yarmouth, at a later period, counselled the employment of stamped paper in lieu of money payment to the post. Rowland Hill's original proposition was that of stamped letter-paper; this was succeeded by a stamped envelope; the third suggestion being the adhesive postage label now so commonly in use. The first stamped cover was presented to Parliament by Mr. Hill, on the 7th of February, 1838. It was proposed that two sorts of envelopes should be used. The first was that of a printed design, bearing the post office stamp, and printed on the half-sheet of letter-paper, so as to admit of the paper being folded with the printed design outside, space being left for the name and address. The second was the envelope, commonly so called the paper being cut and gummed together to a convenient size to contain the inclosure. After the covers of Mr. Rowland Hill, those of Mr. Whiting were submitted to the committee of the House of Commons. The paper bore the impression of an engraved vignette, printed in colours. The inscription which one of these covers bore was, "Post-office, printed matter under one ounce, price 1d. "; another, "Post-office, written matter under one drachm, price 2d". Mr. Whiting recommended the use, in printing, of two or more colours. Mr. Whiting subsequently suggested a moveable stamp. This was a square label, printed in blue, on white paper, and covered in parts by four red rays, forming a Maltese cross, and four others forming a St. Andrew's Cross. In the centre was royal crown; to the left and right the initals, "V. R."; in the upper portion of the surrounding circle, "Principle suggested"; below, "Beaufort House"; and at the corners, "A 3" and "C. W."
"Post Office, under half oz. weight. 1d. "; "Post Office, under one oz. weight. 2d. "; "Post Office, under two oz. weight. 4d. "; "Post Office, under three oz. weight. 6d." Within the square is enclosed an oval, crossed by six red rays; on the bordering, are the words, "Post Office permit, to carry matter not exceeding in weight" and in the centre, "½ ounce, 1d." Another is printed in colours on a white ground. We are acquainted with four examples of this stamp. 1d, red ground blue letters; 2, black ground, red letters; 3, blue ground, red letters; 4, green ground, red letters. The design is waved or engine-turned, and comprises an oval contained in a square; the inscription, "Not to exceed half ounce"; in the centre, "1 penny." At the four corners the numeral "1d"; to the right and left, "V.R." Printed in green on white paper, intended as the stamp for a cover of 1d postage. Printed in black on white paper, bears in an oval the effigy of the Queen crowned, the head turned to the left. In the bordering above, is the inscription, "Postage, 1d., half oz. ;" and below is a small bouquet, formed of the rose, thistle and shamrock. An example of this stamp is in existence, printed in sky-blue on white paper. Printed in marone on white paper. It bears the effigy of the Queen, crowned, the head turned to the left; on the bordering is the inscription, "Postage, one penny." 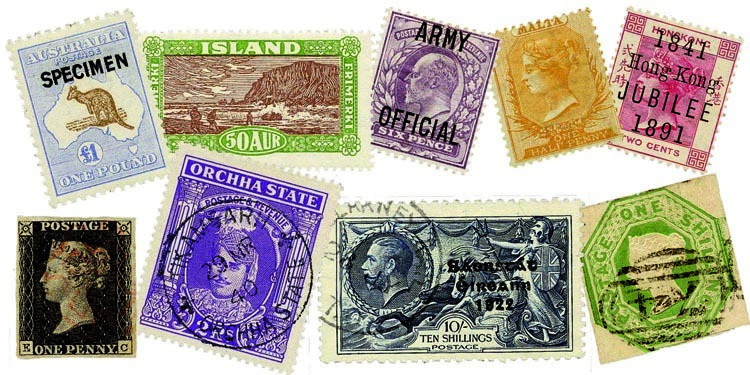 Examples of this stamp are to be had printed in red-brown. In the various propositions laid before Parliament for the working of the penny postage system, that of the employment of "covers" was, at the outset, the most generally approved. Mr. Whiting recommended that the covers used should be printed in two or three different colours, and that the design and execution should be especially directed against the possibility of fraudulent imitations. An engine, turning machine, producing effects similar to those on engine-turned watches, was suggested, and a complicated but graceful design was published by Mr. Whiting as a sample of what he proposed. The vignette, which appeared in the "Post Circular," April 30, 1839, was printed in lilac, and others in bright green. The interior of this cover contained a warm appeal in favour of postal reform. The designs bore in the centre of the upper part the initials "V. R."; to the left, the words "Post Office" and to the right, "Permit"; below the inscription, "Price One Penny; matter not to exceed in weight half an ounce." The cover suggested by Mr. Wyld (1838-9) consisted of half a sheet of paper, made up in the form of a letter; one face was left white, the other presented in the centre an engraved vignette, printed in chamois colour, or clear bistre. The space reserved for the address was enclosed within a double framework; the first formed by foliage, the second by a vineleaf, upon which were represented four female figures; above, in white embossed letters, "Postage prepaid." A postage stamp, adhesive, was to be applied to that portion of the cover on which were the words, "Postage prepaid." This label, circular in form, had in the centre the royal initials, and around it, "Cancelled, post-paid." The letter written on this stamped cover was to be labelled by the Post-office authorities, and pass free. Various other samples were submitted, some of them remarkable for beauty of design, and others conspicuous only by the absence of everything approaching artistic grace; the main object in both instances being to baffle the forger, as it was expected that diligent delinquency would be turning a dishonest penny by the postal alterations. These apprehensions were groundless. With the introduction of the simple postal label — the profile portrait of the Queen, — the dread of imitation apparently disappeared, and the circulation of letters increased enormously. The number of letters circulated in 1839 was 75,908,000; in 1840 it rose to 160,708,000; 1841 to 1850, 277,392,000; from 1850 to 1860, to 409,532,000; and from 1860 to 1861, to 593,240,000. The increase in the decennial period, 1851 to 1860, over that of 1841 to 1850, is 69 in the 100; and 1861, compared with 1840, shows an increase of 250 on every 100. The population of the United Kingdom in 1861 was 29,031,104; the average to each person of letters forwarded, 20 in 1861, and 16 in 1854. The proportion as to countries was, England and Wales 24; Scotland, 18; and Ireland, 9. Correspondence also marks the progress of commercial and intellectual activity in different parts of the country. The proportion of letters received by each person in London during the year, is 47; Edinburgh, 43; Dublin, 40; Bristol, 33; Manchester, 31; Birmingham, 30; and Liverpool, 26.